The world’s most durable roofing product is made by nature. Cedar is prized for its natural beauty, rustic look, and lightweight durability in tough climates. 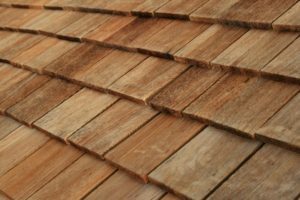 All cedar shingles and shakes are treated with fire retardants and can meet all local building requirements and fire restrictions. There are many different mills producing wood shakes, which are governed by the Cedar Shake and Shingle Bureau. Premium grade shakes provide the best quality wood with up to 100% clear heart wood grain.